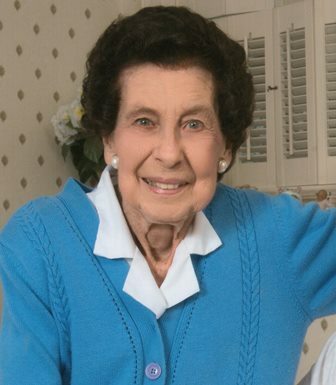 Eva Tolson Sugg, 89, passed away peacefully at her home in Pinetops, on Thursday, September 06, 2018. She was preceded by her parents, Thomas L. Tolson, Sr. and Effie Proctor Tolson; sister, Nora Tolson Flanagan; brother, Thomas Lester Tolson, Jr., William Dock Tolson, and Fred Lewis Tolson; brothers-in-law, Dr. Woodrow B. Sugg, Edward L. Flanagan. She is survived by her husband of 70 years, Norfleet Lane Sugg; sons, Dennis Lane Sugg (Glynn), Barry Thomas Sugg (Brenda); daughter, Vicki Sugg Branch (Steve); eight grandchildren; six great-grandchildren; brothers, Milton House Tolson (Dottie), Edward Norris Tolson (Betsy), and Joe Pat Tolson (Janice); sisters-in-laws, Charlene Holcombe, Josephine McConnell (Charles), of Georgia. She graduated from South Edgecombe High School, where she excelled in basketball and softball, and was a member of the Beta Club. She enjoyed having lunch with six of her high school classmates at their monthly luncheon together. Eva was raised on the family farm. She learned to cook at an early age, in addition to her farm life duties. Prior to marriage, she worked at Carolina Telephone and Telegraph Company and also at the Belk Tyler Store in Tarboro. Eva and Norfleet were married on March 19, 1948, after he graduated from N.C. State University and after he returned from serving in the U.S. Navy in WWII. She served as a Cub Scout Den Mother for her two sons, Dennis and Barry. She was a dedicated volunteer for the American Red Cross. She was an active member of the Pinetops United Methodist Church, serving in the choir for 52 years, treasurer of the Suzanna Wesley Circle, Sunday School Secretary, and she would open the church for Sunday school and church services for over 25 years. When food was needed in the church she was the first to respond and help. A funeral service will be held at 11:00am on Saturday, September 8, at the Pinetops United Methodist Church. The family will receive friends and relatives on Saturday from 10:00-11:00am at the church. Burial will follow in Pineview Cemetery, Pinetops. In lieu of flowers, the family request that memorials may be made to the Pinetops United Methodist Church, P.O. Box 13, Pinetops, NC 27864.